I’ve not had very many Cragganmores and have reviewed even less. 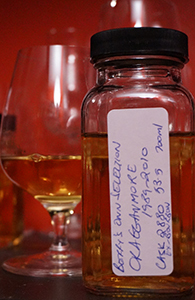 This is largely because this is not a malt you see very often from the independents, especially not of late: Signatory released a handful each year through the 2000s but Whiskybase doesn’t list any from them for the last few years. This one was bottled by the well-regarded German outfit, Malts of Scotland, and is only the second of two Cragganmores they’ve put out so far. In fact, they’re so unused to putting out Cragganmores that they misspelled the distillery’s name on the label (Craggenmore). I guess this might make this a collector’s item for idiots some day. This is the second of two reviews of 1989 Cragganmores. Unlike yesterday’s iteration this one is from a refill sherry cask. It was bottled for K&L in California for their Faultline label. This is the second Cragganmore they’ve bottled in that series, and I’ve had a sample of the previous one, a 20 yo, 1991 from a bourbon cask. That one didn’t impress me overmuch. As I paid for a full bottle of this one I’m hoping it puts on a better showing. I have a pretty good streak going with K&L’s selections and despite what I think of their marketing ways I’m not bloody-minded (or rich) enough to want to have paid for middling or poor whisky just so I can complain about them even more. 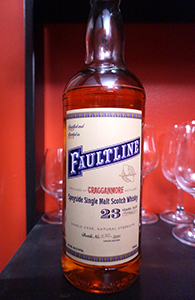 This Cragganmore, bottled by Berry Bros. and Rudd, is from a bourbon cask and is either 20 or 21 years old. I emptied the bottle a year and a half ago, but as is my custom with malts I find interesting for one reason or the other I’d put 6 ounces aside from when the bottle was near the halfway mark. In this case, actually, I saved it not because I found it to be such an interesting malt, but because Cragganmores are thin on the ground; and as I didn’t/don’t expect to have too many opportunities to buy Cragganmores in their 20s it seemed to make sense to save some for comparisons should I ever come across more. And, as it happens, I have. This is being sampled alongside another from 1989 (from a refill sherry cask) and that review will appear tomorrow.